Practicing tattoo artist and designer Mateusz Sarzynski’s paintings are dark, occasionally political, and deeply ironic. 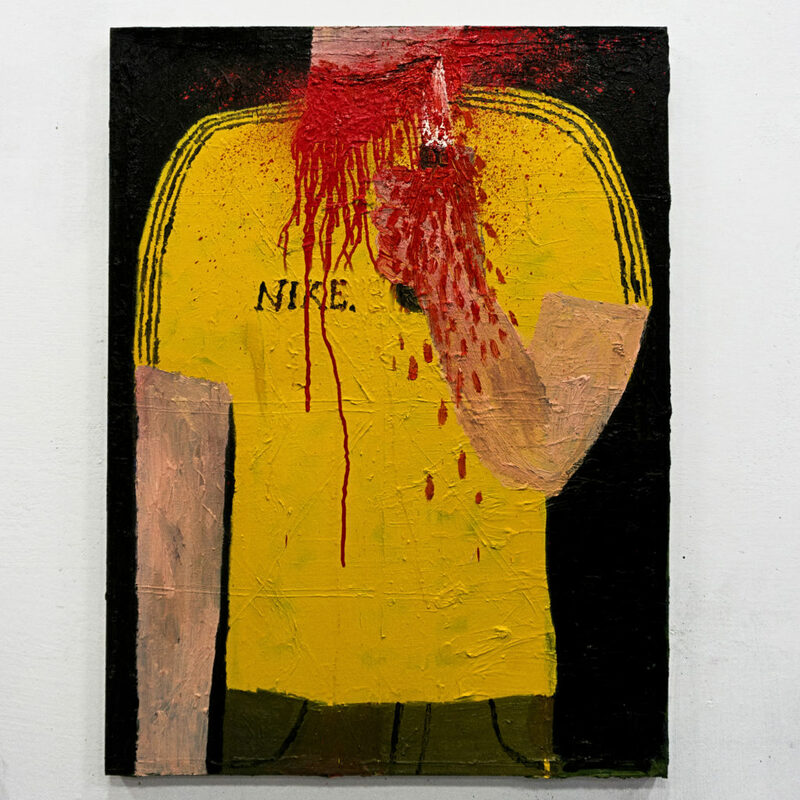 Mostly self-taught, Mateusz uses oil paint and acrylic spray paint as his medium to address situations from everyday life, current events or video games, the internet, television, and tabloid press, depicting violent reflections on capitalism and today’s media. He paints rather fast, attempting to finish his canvases in one day without using sketches, balancing between the seriousness and the irony of the content. Exhibitions include 2018: Between Salvation and Constitution, BWA Warszawa Gallery (Warsaw, Poland), large drawings, Three Works (Scarborough, England), GROBING 2018 praktyczne porady, galeria smierc frajerom (Warsaw, Poland), weltschmerz, Widna Gallery (Cracow, Poland), 17th Hestia Artistic Journey competition, Museum on the Vistula (a branch of the Museum of Modern Art in Warsaw, Poland), Rude Assemby part 2, Campbell Project Space (Sydney, Australia); 2017 We are the ones, vol.1, CGK (Copenhagen, Denmark), MTRS, Rondo Sztuki Gallery (Katowice, Poland). Mateusz Sarzynski’s month-long residency is made possible with support from Hestia Artistic Journey, a prize established in 2002 for the promotion of young Polish art and artistic education, and the ongoing residency partnership with Residency Unlimited.